Captain (N) Errington Ricardo Shurland was appointed Executive Director of the Regional Security System by the Council of Ministers on February 1, 2017. He is the former Deputy Chief of Staff of the Barbados Defence Force and comes to the position with over 33 years of military service. During his career in the military Captain (N) Shurland served in several operational and administrative posts. He also served as Barbados’ alternate representative at the Organisation of American States and Chief of Delegation at the Inter American Defence Board. Captain (N) Shurland is a graduate of the Britannia Royal Naval College in Dartmouth, England and the Command and General Staff College of the United States Army, Fort Leavenworth, Kansas. He holds a Master’s degree in Maritime Administration from the World Maritime University in Malmo, Sweden. His military honours include the Queen’s Jubilee Medal, the Governor-General’s Medal of Honour, the Services Medal of Honour, the General Service Medal and two Defence Board Commendations. 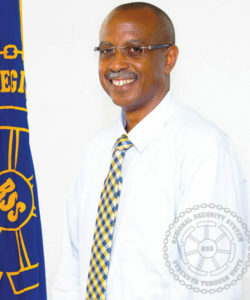 Captain (N) Shurland has also served as Barbados’ delegate to the United Nations and the International Maritime Organisation. He was an adviser to the Barbados delegations, negotiating the Maritime Boundaries and Fisheries Agreements with Guyana and Trinidad and Tobago. Additionally he has served on a number of national committees including Port Security Committee, Standing Committee on Coastal Hazards, National Maritime Inter-Agency Committee, National Hydrographic Committee and the Maritime Training Committee at the Samuel Jackman Prescod Polytechnic. Captain (N) Shurland is a regionalist at heart and remains positively committed through collaboration with regional and international partners to developing policies and strategies to counter current and emerging threats to the stability of the sub-region. The key to sustained economic growth and development is a safe and secure environment and this is vital for the public good of the sub-region.